For most of my life, I was a man without a drink. Yeah, this is not a typical topic for this blog. I normally try to stick to writing about software and such but I’ve been in a bit of a rut. I hope it helps to change it up and write about something I’ve been enjoying lately. Now back to the story. I didn’t drink in college because the environment was quite Lohanesque and that didn’t appeal to me. For many college kids, the focus of drinking is to get wasted. The choice of alcohol is dictated by what a student can afford and what will get them shitfaced most expediently. Not all college kids, mind you. But a lot. 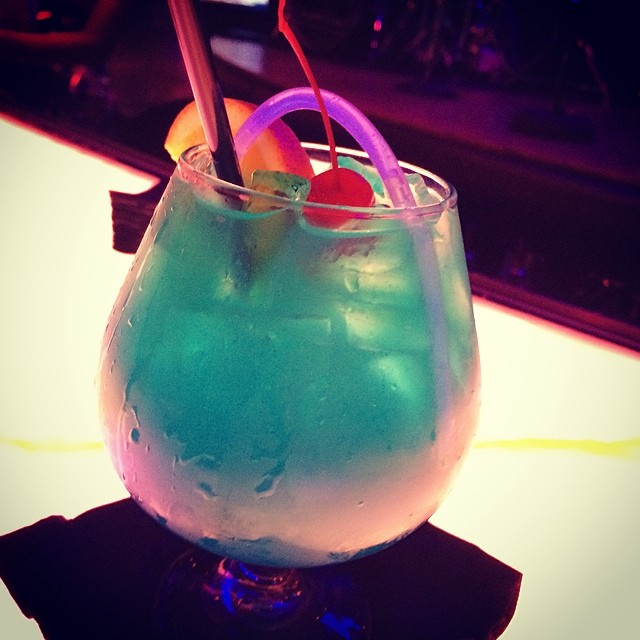 When I first started to frequent bars and clubs, my drink choices revolved around what drinks were sweet and would get me buzzed. I went through that puerile Long Island Iced Tea period. I had my brief infatuation with Adios Motherfuckers. Remember kids, blue drank spells trouble! But sometimes, trouble is exactly what you want. But when faced with a classy social situation, I always hesitated when it came to ordering a drink. I hadn’t found my drink. I went through a Mojito period (which I still enjoy on a hot summer day), the gin and tonic period (which I mostly just tolerated), and so on. I envied the people in movies and television who knew exactly what they wanted. Bond, James Bond, knew he wanted a Martini, shaken, not stirred (which I hear is actually the opposite of how a martini should actually be prepared but I digress). Don Draper can be counted on to order an Old Fashioned. Which coincidentally became the first drink that was “my drink”. 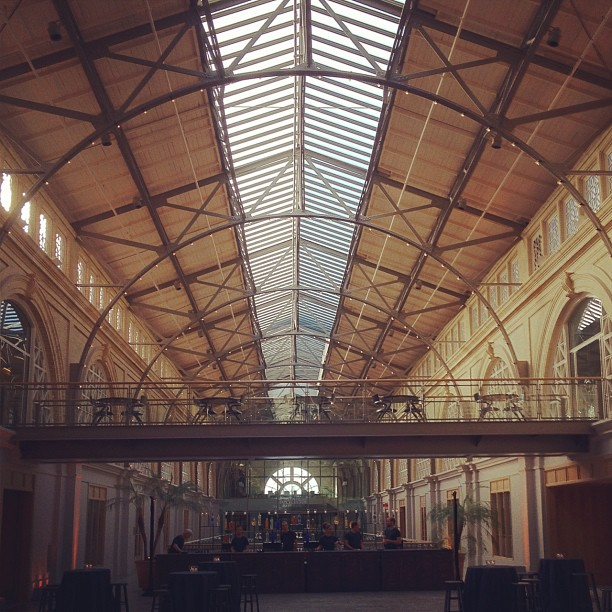 To celebrate shipping GitHub for Windows 1.0, GitHub threw a party at the Ferry House in San Francisco. It was a classy affair with several bar stations. As per the usual, I asked around for drink recommendations. Someone mentioned I might like a Gimlet so I got in line with that in mind. When I get to the front of the line to order, the bartender swept his hand across the ingredients arrayed in front of him and told me that this was an Old Fashioned station. He only made Old Fashioneds. Perfect! It was the direct opposite of the Paradox of Choice. Given one choice, I knew what to do. So I ordered an Old Fashioned and we instantly hit it off like a traveler in a foreign country without an international data plan who finds an open wifi network. Where have you been all my life? So began my love affair with the Old Fashioned. There was only one problem, I couldn’t for the life of me make a decent one at home. Part of the problem is there’s too much work involved and I’m lazy. Like - turning on the tv, jumping on the hotel bed, and watching the hotel channel for an hour because the remote is broken and I can’t be bothered to get back up - lazy. Around that time I was introduced to the Classic Manhattan. There was a particularly good one at the iPic theater (of all places) made with a bourbon they kept in a small cask (they no longer have this specific bourbon, but their Manhattan’s are still good). This became my new drink. It’s Old Fashioned’s simpler more refined minimalist cousin. There were evenings I’d walk a mile to the local Tutta Bella to order one because I’d get the craving. Apparently, there are antidotes to my laziness. Until my wife smacked me with an epiphany. Go to the Total Wine and More store, pick up the ingredients, and learn to make one. Of course! A classic Manhattan is much easier to make than a proper Old Fashioned. There’s only three ingredients, Rye Whiskey (for a classic, though I prefer Bourbon), Sweet Vermouth, and Angostura Bitters. Should you choose, you can also garnish it with a maraschino cherry, which I always do. Here’s how I prepare my Manhattan. I’m interested in some simple easy variations though, if you have them. Remember though, I’m lazy. An important note. If you’ve ever gone to a classy bar, you’ll notice that the cherry they use is darker and more flavorful than the bright red supermarket Maraschino cherry. These cherries are often Bourbon infused and cost a lot more than the bright red variety. I think they’re absolutely worth it. If you’re single and have ample freezer room, freeze your glass. What I do is fill it up with crushed ice while I’m making the drink to keep the glass cold. I’ll remove the ice before I pour in the drink. Freeze or fill up your glass with crushed ice. It’s nice to have a cold glass. Fill up your cocktail shaker/mixer with ice. I use crushed ice. Pour 2 ounces of Rye Whiskey/Bourbon into the shaker. Pour 1/2 ounce of Sweet Vermouth into the shaker. Add 3 dashes of the Angostura Bitters to the shaker. Stir well to get it cold. Most sites (and I) recommend not shaking it and making it frothy. It’s really up to you. If you want to go all Tom Cruise on that, by all means. Empty the ice from the glass (important!). Put the shaker cap on and pour the cocktail into the glass. Add the Maraschino cherry and maybe a bit of the cherry juice if you like. Savor your perfect classic Manhattan, you classy person, you. Learning to make this drink saved me a lot of money considering a Manhattan with good Bourbon can go for over ten to fifteen bucks at a bar. My next goal is to learn a few variations and maybe one alternative cocktail for when I get tired of drinking the same thing all the time. In addition to a fine cocktail, I’ve come to appreciate a good Scotch. Like Ron Swanson, I like a good bottle of Lagavulin 16. 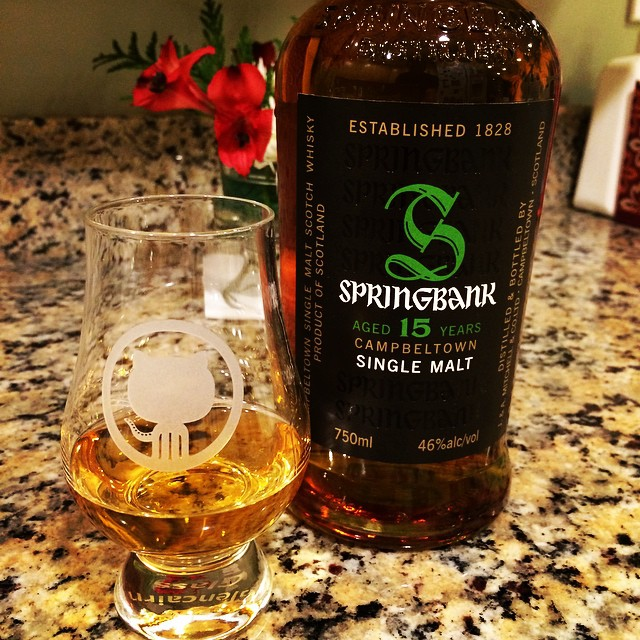 When I finished that, I started experimenting with other bottles and am currently working my way through a Springbank 15, a gift from my wife. It looks particularly good poured into an Octocat Glencairn glass. I have Richard Campbell, a most knowledgeable Scotch connoisseur, to thank for my Scotch kick. What’s your go to drink and why? You've inspired me. My go-to-drink is a Whisky Sour. There are a *lot* of places that do not know how to make one or make it right. But I'm very lazy, and I haven't thought to learn the intricacies myself. I'm also a big Makers Mark fan, but I'm no longer satisfied with a peasant Bourbon and Coke. This recipe of yours looks right up my alley. When I visited Brazil I think I drank a lifetime's worth of caipirinhas! It's really good but a bit sweet for me these days. Yeah, I'll only mix a coke with it if they don't have a decent bourbon. If it's a good bourbon, it feels like sacrilege. I like drinking bourbon neat as well as in a cocktail. 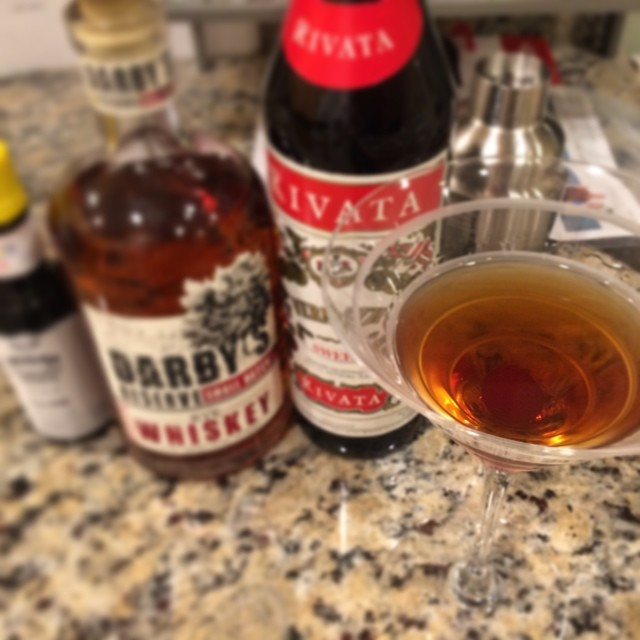 I also make Manhattans at home but like to mess around with different bitters and garnishes. I recently enjoyed orange bitters with crushed ginger and a twist of grapefruit. Lavender bitters with whatever frozen fruit happens to be in the freezer is also quite nice (if you enjoy florals). I too enjoy Makers Mark (and 46 of course), but I sure have been enjoying Angel Envy lately. Bit of a nuisance to find on the west coast, but worth it. Angels envy is indeed awesome, but doesn't it break the official bourbon rules, being finished in port barrels? My favorite bourbon lately is Angels Envy. It's finished in port barrels and has a very unique flavor. Really good neat or with a little ice. Russell's Reserve 10 year bourbon is also worth a taste. If you ever make it out to northern Utah (there's quite a bit of tech happening here), you should venture to High West distillery in Park City. They make Manhattans with their Rendezvous Rye (another favorite of mine) and bourbon-soaked cherries. Very tasty. I haven't touched a mixed drink in ages, but that does look good. I was a scotch drinker for a while, but enjoy mainly beer and wine now. My go-to scotch was The Macallan; 10 and 12yo. I'll have to give the Springbank a try. Thanks for sharing. I'm a big Manhattan fan as well though I prefer mine with rye. You can't go wrong with Templeton Rye. My favorite scotch is Black Grouse and favorite bourbon is Four Roses. Kentucky checking in with some Bourbon recommendations. Give Willet Pot Reserve a chance. Neat bottle and is pretty solid bourbon, and the price isn't so bad that you feel bad mixing it with something else. Weller 12 Year is a must purchase if you can find it, but unfortunately a few years back the secret got out and it got snagged up. Haven't seen it in KY in quiet some time, but if you live in a place that isn't bourbon crazy or full of people reading bourbon reviews online you might be able to find it still. Got a bottle in Georgia recently. Tequila. Reprasado preferred, but anjēo if you must. Nice and spicy without the nasty aftertaste of whiskey. (Welsh whiskey and some Japanese ones are ok tho). Neat, on the rocks or with a small amount of lime juice. Sake. Mmmmmm. And emo (??) shochu, which is make out of sweet potatoes. Think Japanese vodka. For Bourbon: I'd highly recommend Bulleit (normal or rye) for mixing. For Scotch: you might try Oban 14 next. Very reasonably priced for such a tasty dram. I do love an Old Fashioned, although I've only ordered them when I've been out, not tried to make one myself. A local small bar does a particular awesome variation called the Kraken Old Fashioned made with Kraken spiced rum. Haven't tried a Manhattan but I probably should based on this article! On the Scotch front I'm currently enjoying a bottle of Aberlour 10-year old which I heard described as "the best single malt you can get for such a reasonable price", and it's certainly very good! It tastes like cinnamon apple pie. Amazing. A cosmopolitan, and you're sure to be noticed confidently sipping a bright pink drink at the bar. Lots of variations, but I usually go with 2 parts vodka, 1 part triple sec, 1 part cranberry, and a splash of Rose's. Shake with ice and serve in a martini glass. It's fun because you can create lots of different variations by adjusting the amounts or swapping out things for the triple sec part (this is the nerd "drink-hacking" appeal), but it's hard to screw it up to the point that it's undrinkable. If you liked Lagavulin and Springbank I suggest you to try any bottle of Longrow you can find ;) Same distillers than Springbank but this is a peated scotch. If you are looking to experiment on vermouth, I recommend Dolin. You might have to find a specialty liquor store to find it, but since it's 1/3rd of the drink (give or take) it's worth the effort to find something that isn't cheap swill. Try sipping a small amount of whatever vermouth you use on its own. If it isn't good enough to drink without mixing, it isn't good enough to mix. If you are enjoying Scotch, the Rob Roy could be your next experiment. Oooo my drink is definitely an Espresso Martini. The standard one is very good, and there are so many variations to add a flavour, hazelnut (Frangelico), cream (Baileys), vanilla (Galliano, the original one, otherwise sub the vodka for vanilla vodka(Absolut)), chocolate (any Mozart), it all just works! Little lower on the complexity ladder my favourite is an Amaretto Sour. Below that I actually enjoy a nice Gin&Tonic (But not just any gin ... prefer the more herby ones like Bombay Sapphire or Hendricks). My drink is beer. Not the cheap stuff, but the dark, the rich, the microbrewed. I live in Michigan and we have more local breweries than you can shake a sheath of barley at. There are so many brews to try and so little time. you may want to consider adding a sidecar to your go to drinks. Extremely easy to make at home. Not exactly classy, but nothing beats Sailor Jerry's (Cherry Coke Zero is a great mixer) in my book. It all seems like too much work when you can just crack open a bottle of cheap tequila and shoot straight from the bottle, and get a the same affect. Four Roses makes the best bourbons in any category. I've never thought an Old Fashioned complicated. I guess muddling sugar can be, but since I'm lazy I just use simple syrup and call it a day. Rye, simple syrup, and bitters. Done. It's muddling the orange slice that gets me. Shake lightly over ice and strain into glass containing one large ice cube. Enjoy. Angels Envy is still bourbon because it was aged for at least 3 years in charred, new white oak barrels. There are no rules about finishing. Makers Mark uses french oak staves in the barrels to create their Makers 46. You just can't add any flavoring during the filtering process. Gin+Tonic : Use Hendricks Gin, Fever tree Tonic and slices of cucumber.... awesome. Also try Gin Mare, Fever tree and a branch of rosemary .. awesome, but finding the bottle in US is hard.. I am more a Dry Martini guy (Bombay Sapphire & Noilly Prat equal parts + orange bitters, garnish just with lemon twist, forget the olive! ), but I use to mix a Manhattan for my father-in-law once a week. Here in Spain we have some limitations regarding bourbons (I use Jack Daniels) but we got an excellent red vermouth (Yzaguirre Reserva) that gives a very powerful aroma to the cocktail. I love a good cocktail, especially if the bar has their own unique types that I haven't seen before that will catch my interest. However for the most part, my drinking has become simplified, when I go out to a bar or club. I order Vodka and Water, and while I'd prefer to order a decent Vodka, I'll take a bottle of Absolut as terrible as it is. Kinda blows people away that I drink it like this..... KISS is my excuse these days. As for single malt whiskeys, go get yourself a cask strength A'bunadh by Aberlour. Myself and many others I know are very appreciative of this whisky. I see you have a butchered version of the over-sized label on the Angostura bitters. It is supposed to be over-sized :-) Manhattan is an excellent cocktail (my signature too). I prefer it with Noilly Prat and a Canadian Rye Whiskey. Finish the glass with a bit of orange peel for some added flavor intensity. Delicious! Oh man I love a good old fashioned or whiskey sour! Whiskey-wise, Glenfiddich is s firm favourite, but I have so many Irish brands to choose from living in Dublin. Really like your Glencairn glass too; jelly! Jeremiah Weed, Bourbon Liqueur because it's 100-proof strong and sweet. Next on my list is Tuaca straight up or over ice, another sweet liqueur but not as strong. Thanks for the great change of pace story! Brandy a batch of pitted cherries. You'll immediately go Little Mermaid, singing "it's a whole new world!" Soak them in inexpensive cognac (or apple brandy), a couple black cardamom pods and cloves. My go-to Manhattan is made with Rittenhouse Rye, Carpano Antica Italian vermouth and Luxardo cherries. Rittenhouse is an excellent vin ordinaire rye, but at 100 proof, it stands up well to the amount of watering down that a well-chilled Manhattan goes through. The Carpano Antica vermouth is aromatic enough that it works both as vermouth and bitters. It's a bit on the expensive side, but it lasts. Finally, the Luxardo cherries are genuine maraschino cherries in a thick (non-alcoholic) syrup. They're firm and tart without having the medicinal taste that maraschino cherries from your typical liquor store have. They're also a bit expensive -- probably around $20 for a container, but a container will last you for probably 50 Manhattans, so (IMO) it's worth it. I like Manhattans, but also a variant called a 1794 that adds an equal amount of Campari. The 1794 must use rye whiskey instead of bourbon, because it's named after the year of the Whiskey Rebellion, when western Pennsylvania rye farmers fought against federal taxation. It also usually has equal amounts of whiskey, sweet vermouth, and Campari instead of being heavier on the whiskey. My favorite bourbon is Blanton's. Really amazing.